John Green is an award-winning, New York Times-bestselling author whose many accolades include the Printz Medal, a Printz Honor, and the Edgar Award. He has twice been a finalist for the LA Times Book Prize. His novels include Looking for Alaska, Paper Towns, and The Fault in Our Stars (soon to be released as a feature film—June 2014). With his brother, Hank, John is one half of the Vlogbrothers, one of the most popular online video projects in the world. 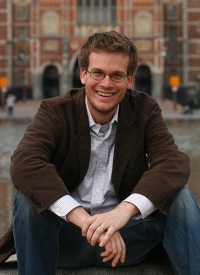 You can join the millions who follow John on Twitter (@realjohngreen) and tumblr (fishingboatproceeds.tumblr.com) or visit him online at johngreenbooks.com. John lives with his family in Indianapolis, Indiana. Ticket Cost: Ticket sales for this event are now closed. Tickets will not be available onsite. PLA thanks Penguin Young Readers for its support of this event.